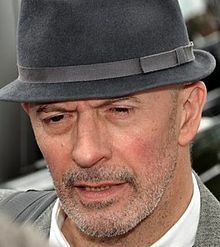 Jacques Audiard (French: [ʒak odjaʁ]; born 30 April 1952) is a French film director and screenwriter. He is the son of Michel Audiard, also a film director and screenwriter. On September 2, 2018, his first American film The Sisters Brothers had its world premiere at the Venice Film Festival. ^ "2012 Official Selection". Cannes. Retrieved 2012-04-19. ^ "Cannes Film Festival 2012 line-up announced". timeout. Retrieved 2012-04-19. ^ Henry Barnes (24 May 2015). "Cannes 2015: Jacques Audiard's Dheepan wins the Palme d'Or". The Guardian. Retrieved 24 May 2015. ^ Rebecca Ford (24 May 2015). "Cannes: 'Dheepan' Wins the Palme d'Or". The Hollywood Reporter. Retrieved 24 May 2015. ^ Tartaglione, Nancy (July 25, 2018). "Venice Film Festival Lineup: Welles, Coen Brothers, Cuaron, Greengrass, More – Live". Deadline Hollywood. Retrieved July 25, 2018. ^ "Cannes Palme d'Or awarded to French film Dheepan". BBC. 24 May 2015. Retrieved 25 May 2015. Wikimedia Commons has media related to Jacques Audiard. This page was last edited on 14 January 2019, at 21:03 (UTC).